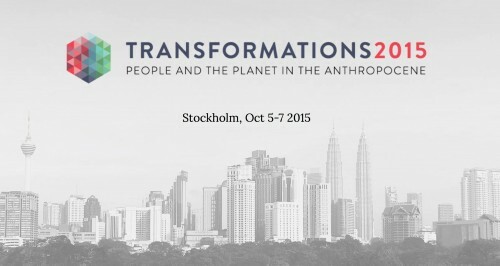 The Conference “Transformations2015 – people and the planet in the Anthropocene” will be hosted by Stockholm Resilience Centre, 5-7 October 2015, in Stockholm, Sweden. This will be the second transformations conference in a series of biannual conferences, and following the start up in Oslo, Norway, with the conference “Transformation in a Changing Climate” in June 2013. The Stockholm conference will be an important event as it will continue those important discussions started in 2013 on deliberate, ethical and sustainable transformation in response to complex global challenges associated with environmental change and climate change. Transformation is slowly working its way into our vocabulary still with numerous meanings and interpretations. Both in research, politics and business there are diverse perspectives on transformation and more than ever it is important to discuss what needs to be changed and why, and the links between technical, political and personal change. The Transformation2015 conference will focus on transformations to sustainability, through solving problems in the Anthropocene and creating conditions for good lives for people, today and in the future, while strengthening Earth’s life support system. The conference will gather people from various disciplines around the world to share cutting-edge research on transformations to sustainability, and through a Science MashUp explore the research frontiers in this developing field. The conference aims to build a better understanding of large-scale systems change and fundamental changes in people-planet relationships that can have an impact at scales that match the problems of the Anthropocene. During the conference the participants are invited to critically examine whether the solutions (including both technological and social innovations and experiments) currently promoted by various change agents to deal with the challenges of sustainable development contribute to the large-scale transformations that humanity needs or whether they reinforce current unsustainable pathways. Along with this scientific endeavor, Transformations 2015 also seeks to provide a creative space, Transformation Labs (TLabs), for a broader set of actors outside of academia, such as innovators, business, entrepreneurs and policy makers to co-create knowledge and co-design solutions within specific problem domains, such as food systems or sustainable cities. With an “unconference” format, the Science MashUp and TLabs are intended to create opportunities that could lead to large-scale, transformative change. The Science MashUp is an opportunity for researchers from diverse disciplines and backgrounds, who have studied sustainability transformations through different lenses, to share and discuss analytical approaches and insights on transformative change, and together identify the research frontiers in this field. – Patterns of transformations will focus on what transformative change means in the Anthropocene. Questions to be considered include: what are the necessary changes in interactions between key variables for sustainable development, including on the one hand personal, cultural, political and institutional factors and on the other hand ecological ones? How do transformation processes unfold in different types of systems? – Scaling up for transformative impact will focus on factors for fundamentally changing human-environmental interactions and feedbacks. Understanding scaling – that is, how new ideas, experiments and initiatives can have large-scale, systemic impacts – is key in this regard. The conference will explore how innovations that seem promising on a local or micro scale can continue to benefit both people and the planet as they are scaled up. – The role of change agents in sustainability transformations will focus on the role of individual agency and networks in driving transformative processes. Discussions will consider questions surrounding the strategies and skills that change makers use, the actors that operate in the space to match the solutions to the scale of the problems, opportunity contexts, and the networked innovation process. – New and emerging approaches for studying sustainability transformations will involve discussions about new types of research methods and approaches that will be needed to improve understanding about the sub-themes above, how they differ from current modes of research, and can more effectively advance understanding about transformation and facilitate change. The conference will use the methodology of Transformation Labs (TLabs) to harness experiences and insights from a broader group of people involved in ongoing experiments and initiatives around the world, to explore solutions for a good Anthropocene. TLabs are spaces for exploring the interface between social, technological and ecological systems where humans and nature are treated as an integrated whole. They will enable change-makers, such as social entrepreneurs, academics, policy makers, business representatives, artists and others, to co-design initiatives to urgent sustainability challenges. The TLabs will focus on specific problem domains such as food systems or urban development, and explore solutions that address both social and ecological aspects of these problems, and reconfigure the existing human-environment interactions in ways that can create systemic change for a better future. The “unconference” format will enable vibrant conversations and ensure a maximum exposure to different perspectives, allowing for innovative ideas and new collaborations to emerge. It includes both conventional and unconventional meeting features, which will be tailored to the conference objectives, particularly the need for transdisciplinary dialogue across and beyond academic disciplines. This includes short plenary talks, panel discussions, open space, “fish-bowl” dialogues, and “speed talks”. The design will allow for deeper conversations around participants’ areas of expertise. The conference will also combine arts and science to explore transformations to sustainability. At the 2013 Oslo Transformation Conference, the unconventional format was essential to opening up dialogues, discussions, and debates that cut to the heart of transformation, asking what it would really take to catalyze transformations at the personal, cultural, organizational and systems levels. These conversations also focused on the beliefs, assumptions, habits and loyalties that hinder transformations, and how such impediments might be overcome. Read more about the Transformation2015 Conference.